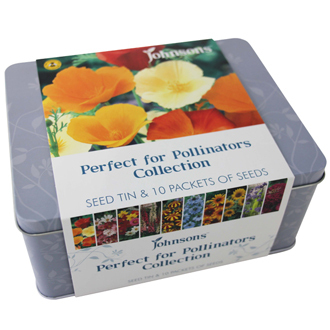 A collection of beautiful flower seeds in a seed tin to help attract bees and butterflies to your garden. 10 packets of specially selected annual and perennial flower varieties, to be sown from February to October. The flower tin contains one packet each of: Californian Single Poppy Mixed, Cosmos Sea Shells Mixed, Dahlia Mignon Mixed, Foxglove Foxy Mixed, Marigold (French) Jolly Jester, Nigella Miss Jekyll, Rudbeckia Gloriosa Daisies, Sunflower Pacino Gold, Verbena bonariensis and Zinnia Purple Prince.